USA Fencing and Absolute Fencing Gear have once again partnered to recognize young fencers who have excelled in high school with All-Academic Team honors. Athletes with a GPA of at least 3.85 (94 or better) are eligible to be named to the First All-Academic Team. Second Team athletes include those whose GPAs are 3.7 – 3.84 (87 to 93). Athletes with 3.5 – 3.69 GPAs (80-86) are recognized on the Honorable Mention Team. In addition to GPA, class rank (where applicable) is reviewed. Only traditional core academic classes will be considered when evaluating transcripts of applicants that are on the border of one team to another. Absolute Fencing Gear has also pledged $10,000 in scholarships for the All-Academic Team program. One female and one male applicant will receive $4,000 each based on both their GPA and essay. Two additional applicants will receive $1,000 each based on their submitted essay. Note: One letter of recommendation are required to be eligible for the Absolute Fencing Gear scholarships. Read the story on the 2017-18 Team and Scholarship winners here. The Connor Porter Memorial Scholarship was created in 2013 through a generous donation from Connor's family members - Trish and Shannon Porter. Connor's father, Pat Porter, was a two-time track Olympian (1984, 1988) and his mother, Trish King Porter, was a high jumper on the 1988 U.S. Olympic Team. "Our thanks go out to Connor's family and, in particular, his mother, Trish. While the Porter family's loss is unimaginable for most of us, his family's generosity will ensure that his legacy is remembered by all of us in the USA Fencing community," said Don Anthony, USA Fencing President/Chairman of the Board. Two scholarships are awarded annually - $2,000 each for one male and one female high school student. To be eligible for the scholarship, candidates must be members of USA Fencing and submit a recommendation letter from a coach, teacher or school administrator. No grades need be submitted as grades will not be considered in determining the winners of the scholarship. In addition, all applicants must complete an essay on a new topic each year. 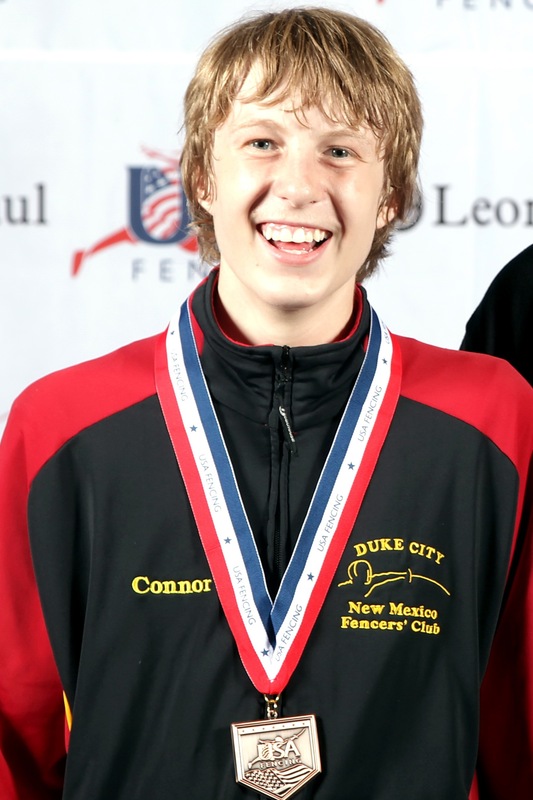 "Shannon and I are very excited to spread Connor's love and enthusiasm for fencing, life and other people. Connor wasn't a 'traditional sport' kind of kid but when he started fencing he was sold from the first day. Fencing brought him so much joy, laughter, life lessons, and taught him discipline," Trish Porter said. "For Connor, it was all about the people he got to be with, all the laughter he got to share, and all the hugs he gave and received. Wherever he went he encouraged his teammates and/or competitors. His smile, love of life, the Lord and others was evident in how he lived each moment to the fullest. Our hope is these awards will help athletes to remember others throughout the process of becoming the best competitor they can become, and to enjoy the process along the way. We are only given one life; may we try a little harder, be a little kinder, and love a little more in the spirit of Connor Porter. Trish Porter and 2013 Connor Porter Memorial Scholarship Winner Liana Semel. Eric Wang was a member of the Fencing Institute of Texas’ and St. Mark’s Men’s Epee Teams. Eric had an effusive smile and demeanor. He walked through life with an air of confidence, but a humbleness that reached out to everyone he met. His competitive spirit led him to fencing and track, and guided him through academic achievements. Eric was a tremendous athlete and gifted student. He embraced life and all those around him as his equal, and gave of himself effortlessly and graciously. With so many lessons left unfinished, Eric still led a good and joyful life. He lived life without any regrets. Although Eric physically is not with us right now, his spirit will always been in our hearts and our minds. ~ Brian Wang (eulogy excerpt) Fencing Institute of Texas, in cooperation with the Wang family, dedicates the Wang Memorial fencing tournament to Eric’s memory. Proceeds from these events are set aside for the scholarship fund. The annual award is a minimum of $500.00 per recipient; higher monetary amount and multiple awards may be given at the discretion of the selection committee. High school seniors and college/university undergraduate students are eligible to apply for this scholarship. To ensure that your application is reviewed and processed as quickly and accurately as possible, please read and follow these procedures and requirements as written. This is not a “need based” scholarship. Nor do you have to be fencing NCAA. All college-bound fencers are encouraged to apply. 1. Enclose only those items requested in the application (do not attach biographies, resumes, or supplemental lists of activities). Requested items must be attached to the application. 2. Answer all questions on the application (“see attached” is not an acceptable answer). 3. All applications must be printed or typed, and with original signatures and include a photograph. Applicants are responsible for legibility and readability. Fencing Institute of Texas, Inc.
5. Applications become the property of the selection committee and will not be returned to the applicant. 6. Submission of an application is in no way a guarantee that a scholarship will be granted. 7. DEADLINE FOR APPLICATION SUBMISSION is June 30th. Post marked dates do not constitute submission; applications should be mailed in plenty of time to arrive at FIT prior to the deadline. Use sufficient postage. There is no one at the club during the day, so do not send via USPS requesting a signature reciept!! This may delay receipt of your application and you may miss the deadline. 8. The selection committee will generally meet in September. The selection committee consists of 3-5 FIT members and 2-4 representatives from other clubs. The committee may meet in person or via email, so all applications should be legible enough for scanning into PDF format. Please use black ink if hand writing your application. 9. The selection committee will notify each applicant in writing of the committee’s decision. There is no appeal and the decision of the committee is final. 1. All applicants must be high school seniors or undergraduate students attending college or university in the fall of the scholarship year. 2. Applicants must submit the completed application in a timely fashion. 3. Applicants must have demonstrated a strong desire to participate in fencing activities and help other fencers. 4. Provide TWO signed recommendation letters from Coaches or Fencers who know the applicant personally. These letters should attest to the general character of the applicant. This is the only endorsement required. Endorsements from teachers, counselors, etc., should not be included and will not be considered. 5. Submit a photo that may be used on the internet and in other publications.